Huonville (pop ~1600) is the largest town in the Huon Valley region of southern Tasmania. Apple and pear production in Tasmania are centred in Huonville, and this is attested to by the presence of the Apple & Heritage Museum. 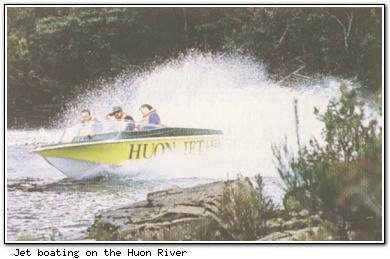 The Huon Jet provides an exciting jet boat ride up the rapids of the Huon River, or, for those who aren't game, pedal boats are available for hire. Another method of seeing the valley is via one of the horseback wilderness tours. Model trains of various types are set up in Huonville. The Tasman Antique Motor Museum is located just northwest at Ranelagh, and has over 40 vintage and classic cars, both American- and European-made, dating from 1906 but restored to their original condition. To the southeast of Huonville are the entrancing Pelverata Falls. Huonville has limited accommodation.